I have officially lost my mind. Please don’t judge me. I will have to ruthlessly decide what items of the past month of ridiculous spending will be going back to the store, and what items from my lulumum closet will be sold to compensate. So far, my husband’s vote has been to send back the Coco Softshell as the cut is just not flattering to my figure (although It’s looked fantastic on everyone else so it’s just not fair it doesn’t look right on me!). Ok, he rarely has negative opinions on my lulu stuff so when he voices one I can trust that he’s right. I’m kind of glad that thats the item on the chopping block as it’s quite pricey. Anyways, this has officially been the Treat. yo. Self month for me. Don’t look to me as the voice of reason this month as I’ve been told multiple times that I’m the ‘Enabling Devil’. 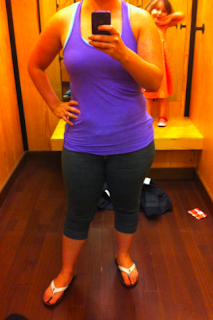 Seawheeze + Power Purple and Angel Blue + fall items = lose all reason and accountability. My store just had a few left of the Tea Lounge Crops and I accidentally grabbed my preferred color (the Dark Grey Commuter Denim) in a six. As you can see below they become wunder unders at that size on me. I was able to find the appropriate size for me in another store though in dark grey commuter so I’m happy about that. The lighter grey commuter shown bellow is the size 8 and it’s form fitting with a bit of slouch and I preferred that fit to the much more slouchy size 10 in black that they had, although I didn’t like it in such a light color. The rise is higher on these so going with the 8 didn’t cause unsightly CT or muffin top. I don’t have any casual lounge pants so I was happy to find these and like them. 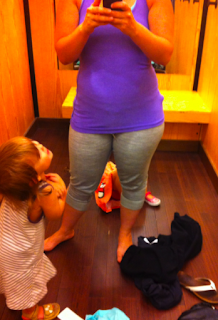 My usual size in pants is size 10 but I do occasionaly go with an 8, especially in run crops that are sometimes more compressive in lower sizes for me and slip down at the waist in the size 10’s. Don’t use that as reference though because I am a TTS 10 on the bottom and just preferred the look of these in the 8 on me. "Tiny Stripe Fare, Heathered Split Pea and Heathered Angel Blue CRB + Scoop on Upcoming Items"
"Define Jackets: Dense Purple/Ziggy Wee Caspian and Currant"